High performance solid copper heat diffusers and defroster plates. Copper is a superb conductor of heat. Not only does copper evenly distribute heat, its greater mass allows it to hold more heat. Dimensions (in packaging): 6" x 6" x 0.13"
My husband thawed a container of very frozen stew on the BellaCopper heat diffuser. It works like magic! Makes cooking at low temperature so much easier! Great product. Copper cookware is prized by kitchen connoisseurs for its unsurpassed ability to distribute heat quickly and evenly. But it’s an expensive metal, and copper pots and pans are an investment that many of us can’t quite justify. 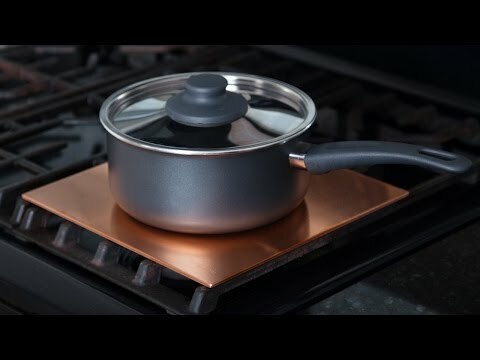 Thanks to Pete Mohler, there’s an affordable way to tap the conductive properties of copper without buying expensive new cookware. Pete, who’s an aerospace engineer, came up with the idea for a copper heat diffuser when he wanted to improve the performance of a mediocre stove. He designed a solid copper plate that fits on top of a stove’s burner, under any ordinary aluminum, iron or stainless steel pan. The copper plate distributes heat evenly across the entire cooking surface of the pan, so foods cook more evenly and with less scorching and scalding. Pete teamed with Bill Hackman, and the two launched BellaCopper to commercialize the idea. BellaCopper’s hand-finished heat diffusers come in different sizes for maximum versatility. You can use two diffusers side by side to turn two adjacent burners into a single griddle-sized heat source, for example. You can use them as hot plates to keep food warm, or in the oven to maintain a more constant baking temperature. BellaCopper’s heat diffusers also double as defroster plates: If you place two frozen chicken breasts on a room-temperature copper plate, they’ll defrost in about 40 minutes as the internal heat from the plate is transferred to the frozen food. 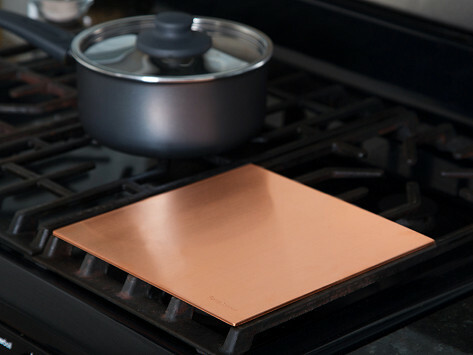 Who knew a simple copper plate could be so useful in the kitchen?